I was not a fan of season two of “The Crown” or of Claire Foy’s performance as Queen Elizabeth II. But what do I know: the program just secured 13 Emmy nominations, including one for its outgoing Miss Foy. Today, Netflix has released a first-look image of the show’s new monarch. Olivia Colman, star of Broadchurch and The Night Manager. 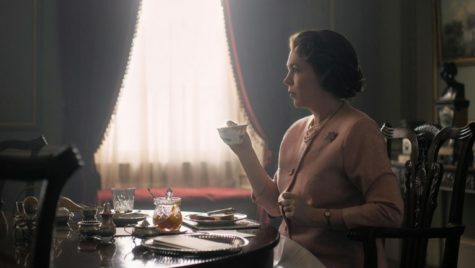 She replaces Foy as Queen Elizabeth II for seasons three and four of the Left Bank Pictures drama, and in the first still is seen drinking a cup of tea and eating toast (with what looks like marmalade spread).